Heat oven to 375ºF (or 350ºF for dark or nonstick pan). Line bottom only of 15x10x1-inch baking pan with edges (jelly roll pan) with foil or parchment paper. In large bowl, beat eggs with electric mixer on high speed about 5 minutes or until thick and lemon coloured. Add cake mix, water, lemon juice and oil. Beat on low speed 30 seconds, then on medium speed 1 minute, scraping bowl occasionally. Pour into pan; spread batter evenly. Bake 11 to 14 minutes or until cake springs back when lightly touched in centre. If necessary, run knife around edge of pan to loosen cake. Turn cake upside down onto clean kitchen towel sprinkled with 2 tablespoons icing sugar; carefully remove foil. 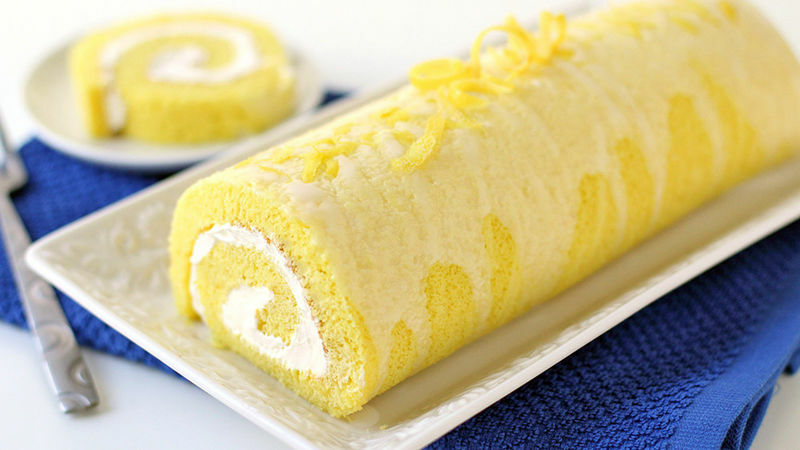 While hot, carefully roll up cake and towel from narrow end. Cool completely, seam side down, on cooling rack, about 1 hour. In chilled large glass or metal bowl, beat 1 cup whipping cream and 2 tablespoons icing sugar on medium speed until foamy, then on high speed until stiff peaks form. Fold in lemon peel. Unroll cake carefully and remove towel. Spread filling evenly over cake; roll up cake. On serving platter, arrange cake, seam side down; cover loosely and refrigerate at least 1 hour. Before serving, sprinkle with 1 tablespoon icing sugar. Store covered in refrigerator.